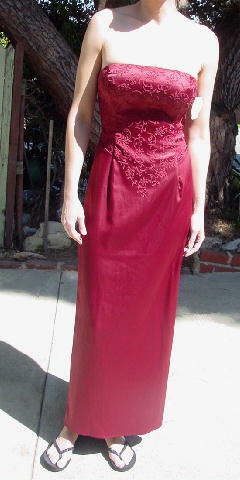 This never-worn (except for these pictures) long special occasion wine color dress is by Windsor and was made in the USA. It's 97% polyester and 3% spanded. The interior top back has a 1 7/8" wide elastic band. 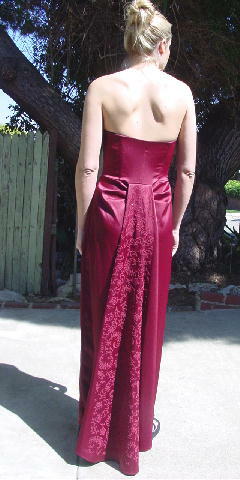 The left side seam has a 13 1/2" long zipper. The front has a flower and leaf design in tiny beads with accents in red glitter. 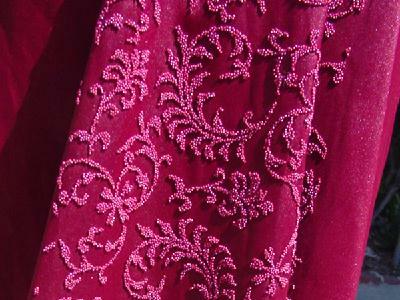 The back has a wide and longer fabric panel with the same beadwork design pattern. The tag says size 9, but it fits like a size 4/6. A stylist bought two identical dresses in different sizes for an actress to wear in a movie (she wasn't sure which one would fit the actress). top center back to bottom center 51"
armpit to bottom side hem 48"
armpit to armpit 13 1/2"